I have many categories in my WordPress website. Each time I am adding new post it is very hard to find specific category that I need this time. 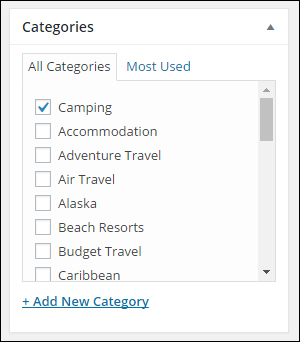 It would be much easier if I had search field right above list of categories (Categories Metabox) when I am editing post. How can I do it? Or maybe there is some plugin for it? For example search button can be added after "Most used" tab. It is not looking very popular but it seems to work. Not the answer you're looking for? Browse other questions tagged categories metabox post-editor or ask your own question. Allow a user to 'subscribe' to different post categories?